Helfand is past president of Physicians for Social Responsibility and is currently co-president of that group’s global federation, International Physicians for the Prevention of Nuclear War, recipient of the 1985 Nobel Peace Prize. He said today: “Two things were most notable in the overwhelming vote for this treaty. One was the urgency felt by the representatives of 122 countries who voted for it. The other was the rather crude and revealing statement put out by the ‘P3’ — the U.S., Britain and France. 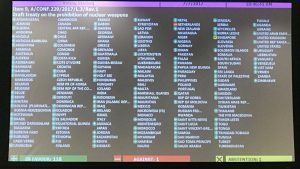 “When this process began several years ago, the five permanent members of the UN Security Council [P5] — U.S., Britain, France, Russia and China — put out a statement against the treaty, arguing that it wasn’t the most useful approach and distracted from their alleged efforts to get rid of their nuclear weapons. “The P3 statement on Friday made clear the real basis of their opposition to the treaty: ‘We do not intend to sign, ratify or ever become party to it.’ It is not the timing or the specifics of the treaty that they object to. They intend to maintain their policy of mutually assured destruction forever, even though they are legally required to negotiate the elimination of their nuclear arsenals under the Nuclear Non-Proliferation Treaty.